One of Rodney’s largest local employers Bayes Coachlines celebrated 30 years in business last weekend. 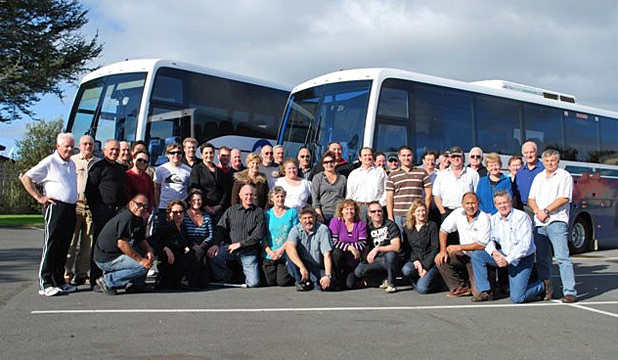 While most companies are tightening their belts to save money, Dairy Flat-based Bayes Coachlines took their 57 employees and their partners to the Bay of Islands for the weekend to celebrate. One of their oldest employees, Ray Fowler, 75, of Red Beach, says he started working for Bayes nearly two years ago after he retired from 61 years of full time work. He says he’s never worked for a company that treats its staff so well. General manager Richard Bayes says the company was formed in September 1979 when his parents Dave and Joan Bayes were operating a limeworks and truck company. A local bus company just down the road called Roberts Transport were keen for them to buy their company and in September the sale went through. "That was on the Saturday and we started the four school runs on the Monday morning, the start of the then term three," says Richard. There was a quick scramble to get licences for the drivers, with help from local police, and by Monday they were driving. The company has grown, and now has 46 buses and coaches, and brothers Richard and John have taken over the running of the business. Their daily school runs service most of the local schools including Orewa College, Orewa Primary, Orewa North, Whangaparaoa and Wentworth Colleges, Stella Maris, Kingsway School and Gulf Harbour School. They also service schools on the North Shore including Kristin, Northcross Intermediate, Rosmini, Carmel and Long Bay Colleges. They do school charters for most of these schools and trips for elderly groups, travel clubs, local churches, sports clubs and teams. Richard says their staff are like family and they felt it was important to celebrate the milestone with them. "We felt that it was very important to have them with us. Without our staff we wouldn’t be here, and celebrating the fact that they are a fantastic group of people." He says many of the staff have been with the company for more than 10 to 15 years, and a few for more than 20. "The business has been built and developed on family values and standards of quality, reliability and integrity. We value our staff and are keen to keep building the relationships we have with them and to strengthen the family culture within the business." "A weekend away as a big group is always fun and from the comments we have had back they all really enjoyed it."